Halloween is just around the corner! It’s time for ghosts, goblins and sweet treats. But what about our pets? Holidays can be stressful for our furry friends. Here are some reminders when preparing for a safe and fun, spooky night. Your pets once tranquil home has been converted into a revolving door of witches, ringing door bells and “Trick or Treat!” screaming children. This may be festive and exciting for us however, this can be stressful for our pets. Keep your pets indoors. Help minimize the impact for those who tend to be nervous or may bite by providing a safe, quiet place for them to enjoy while the festivities are going on. This also includes protecting them from lit candles, even those inside of jack-o-lanterns. Wagging tails or excited pets can easily knock these over creating danger not just for them but also our homes. Thinking of having your furry friend participate in the activities? Be sure to thoroughly check any costumes for proper fit and be sure there are no pieces that your pet could chew off and ingest. Also be sure they are able to breath properly and move freely. Having second thoughts? Play it safe and save the dress up for you and your trick or treat visitors. 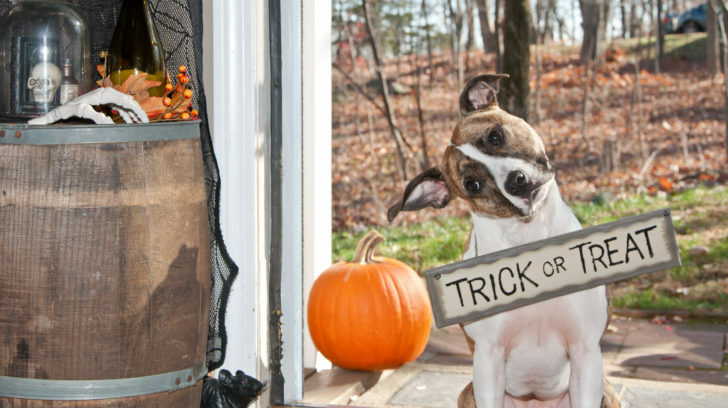 As you fill the candy bowl for your trick or treat guests be sure to keep all candy far from your pets, especially those containing chocolate and xylitol. Chocolate contains theobromine which can be toxic to cats and dogs. Another toxic substance that is not as obvious to find is xylitol. This sugar substitute is popular in gum and sugar free candy. It’s not just the candy to be weary of but also the wrappers! These can pose a risk to your pet’s health if ingested. To keep everyone safe, it’s best to keep all candy out of reach. Even with the best intentions accidents can happen. Be sure your pet’s ID tags and microchip information is up to date in the event a quick dash out the door is made by your pet. Be sure to have your local urgent care facility’s number on hand in the event of a medical emergency. It is even a good idea to keep vaccination records readily available. A little preparation can go a long way to ensuring a fun-filled night!